However, as can be seen in the above chart, from mid 2014 into 2015, as the Dollar index rose from 80 to over 100, large cap stocks outperformed. 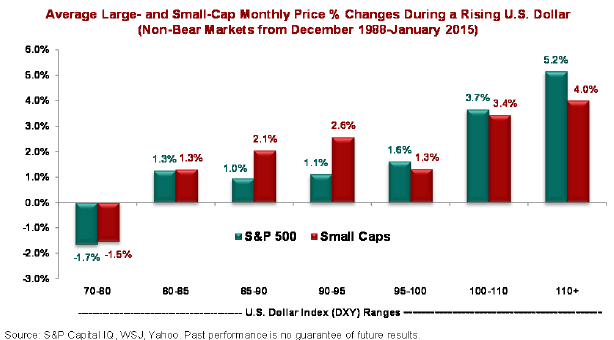 In a research report published a few years ago by S&P Dow Jones Indices, it is noted large cap stocks outperform small cap stocks when the Dollar Index rises above 95 and currently, the Index is near 94. "...it is misdirected reasoning that causes investors to believe that small-cap stocks outperform large caps during a rising dollar. Yes, small-cap stocks have less foreign exposure, so their earnings will not be whittled down during the translation process. Yet many companies hedge their foreign currency exposure, so this becomes less of an issue. More important, in my view, is that international investors are looking to the U.S. and pushing up the value of the dollar." 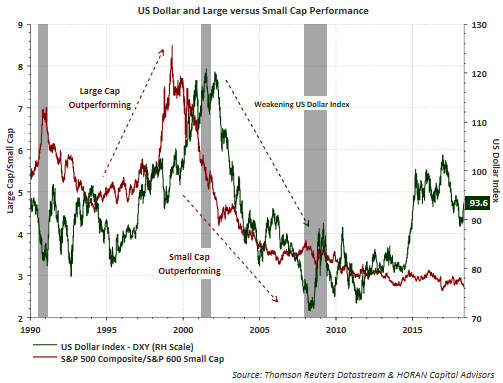 A longer term view of the Dollar and large cap stock versus small cap stock performance can be seen in the below chart. 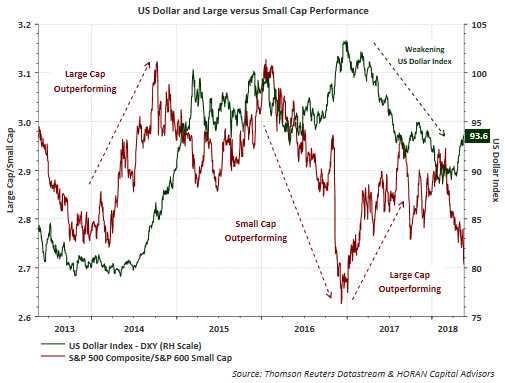 Clearly, a strengthening Dollar has mostly favored large caps over small caps and vice versa. For investors then, Dollar strength alone should not be sufficient reason for allocating funds to small cap stock investments.